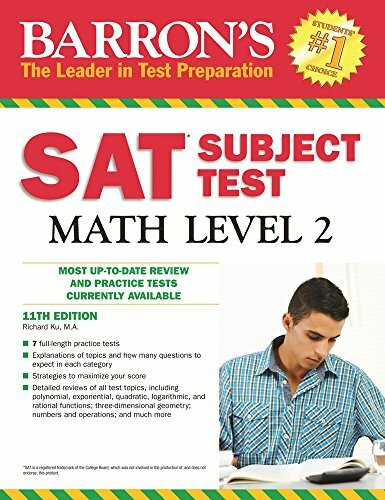 Barron’s SAT Subject Test Math Level 2, 11th Edition by Richard Ku M.A. This manual opens with a diagnostic test that includes explained answers to help students pinpoint their math strengths and weaknesses. In chapters that follow, detailed topic reviews cover polynomial, trigonometric, exponential, logarithmic, and rational functions; coordinate and three-dimensional geometry; numbers and operations; data analysis, statistics, and probability. Six full-length model tests with answers, explanations, and self-evaluation charts conclude this manual. The manual can be purchased alone or with an optional CD-ROM that presents two additional full-length practice tests with answers, explanations, and automatic scoring.